Deviled eggs have always been a favorite of mine at parties, but I am not a fan of the fact that they’re usually drowning in mayo, so I set out to make a healthier but still tasty version. 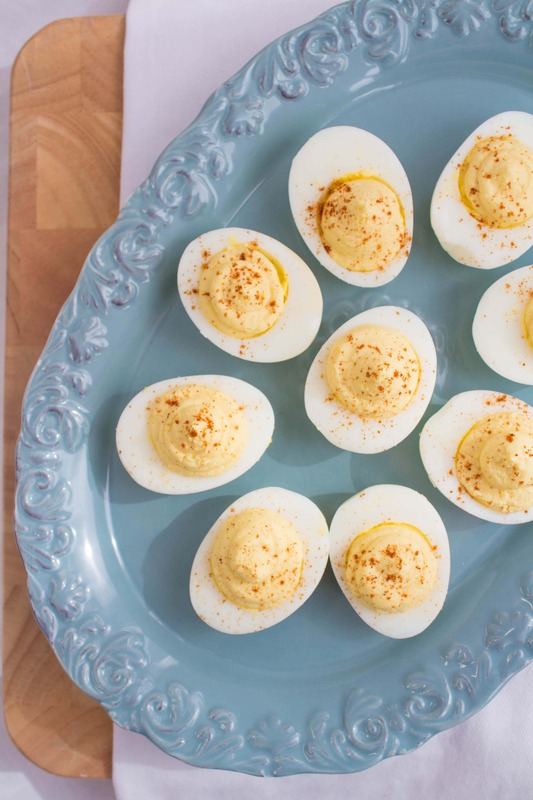 Introducing: Healthy Deviled Eggs! It will be our little secret that they’re healthy – you won’t know the difference! First you need to hard boil the eggs! Place the eggs in a pot, add just enough cold water so that they are fully covered, and put on high heat. Add a little salt to the pot, too — it’ll make them easier to peel. Cover and bring them to a boil, then turn off the heat and let them sit, still covered, for 12 minutes. Then they are ready! I usually rinse them with some cold water and let them sit for a bit to cool them down first. You can also put them in an ice bath. Once they’ve cooled, peel them and cut them lengthwise. Place the whites on a plate and the yolks in a bowl. Add the remaining ingredients (except for the paprika) to the yolks in the bowl, and mash it all together. If you would like the mixture to be smooth, use a blender. Once it is mostly uniform, add the mixture back into the empty egg whites, top with a sprinkle of paprika, and enjoy! I’ve used non fat yogurt on top of baked potatoes and someone I know made little puff pastries using yogurt rather than butter — this deviled egg recipe looks great. I may use non fat yogurt, especially the Greek kind (my favorite) instead of mayo in tuna salad. I always put the mayo in last when making my Mom’s deviled eggs. That way I don’t over do it. For our family recipe we use Mt. Olive Sweet Cube Pickle, the juices from that give you a nice vinegar twist. Then mom insist it has to be yellow mustard…. partly for the flavor and partly for the color. Salt & Pepper. Then the mayo. I have used fat free and low fat mayo so I will have to try using yogurt next time. What I have always wondered…. have you heard of omelets in a bag? Where you put all the fixings and egg mixture into a freezer ziploc bag and then put it in boiling water. It’s a camping/tailgating breakfast trick. I was thinking about taking egg beaters and cooking some like that and then mashing it up instead of egg yolks. I just haven’t had a chance to do that yet. My husband loves deviled eggs but it’s the cholesterol that I need to control. So I’m thinking this might be a way to get rid of the bad yolk and keep the deviled egg. I hope that makes sense what I suggested. Tammy, my husband also has high cholesterol. We have used the “fake eggs” in the omelets in a bag. It works just fine. You don’t get that real “sturdy” formation. But it all tastes the same to use. The omelets are a bit softer than if you cooked them in a skillet or flat top. Perhaps boiling them longer might help, but as long as they are cooked through and taste good it all that matters. Bev, I have tried mashing up chic peas and adding some spices, like salt, pepper, garlic powder, loosen it up with a little yogurt. makes a tasty stuffing for your eggs. So, how many calories are in 1 deviled egg with your recipe? How can you claim they are healthy without knowing the nutritional value of the recipe? What a cop-out that you’re in grad school and don’t have time to use a calculator? Lame. I promote a recipe as healthy when it is full of whole, real, nourishing ingredients, not because of calories/fat/whatever. I’m an intuitive eating dietitian (not in grad school anymore) and I don’t promote calorie counting so I don’t share nutritional information for my recipes. If you want nutritional information, you are welcome to calculate it yourself – or to find another site that shares it! Thanks and I hope you enjoy the recipe! Sarah, there is no need to call someone lame or a cop out. You can find other recipes, that count calories and other pins. Not everyone counts calories. It’s obviously healthy due to switching out a low or non fat Greek yogurt for mayonnaise. Great recipe Ann, thank you for sharing it. Will have to try!! Those look good! I’ve made them the same way, but with curry instead of the mustard and I top them with a little bit of Mango Chutney! I’ll have to try these soon! My friend makes the most awesome deviled eggs – she uses hummus. Sure, as long as it’s plain/unflavored! So excited to try this! I love deviled eggs! Love your recipes. I added snipped chives to the Deviled Eggs. Great color and a mild onion flavor. Sounds great! If you put the yolks in a Baggie, smash them and then add the remaining ingredients , clip the corner of the Baggie and pipe into whites, it works great with just a bit of clean up. Where can I find the nutritional value for these? You can calculate it at SparkRecipes.com if you like! Ok, so I tried this recipe and it definitely did not taste like the regular recipe with mayo. I think the statement that you won’t be able to tell the difference is misleading. I ended up throwing out the egg yolk mixture because I didn’t care for the taste at all. Glad there’s a healthier alternative for those who like the Greek yogurt but it wasn’t for me. I’m sorry you weren’t a fan! I also use plain Greek yogurt as a sour cream substitute whenever I make tacos or nachos! Great idea with the pickle juice, yum! I added a little sautéd broccoli (~1/3 cup) and a 1/2 tablespoon of pesto and 1/2 teaspoon of hot sauce. They’re amazing! Thanks for proving I could do this with yogurt! Sweet – glad the whole fam enjoyed them! Like shelly said, no, these will NOT be the same as the regular mayo kind. Because of the mustard and yolks, people scarfing them down might not notice. In a side by side comparison they certainly would. But not wanting to put all the calories and fat on a lot of things I use nonfat Mayo. Not the same, but worth the sacrifice. I have made deviled eggs with it also. Nonfat Greek yogurt would be similar. Thick, smooth, white, a little tang. 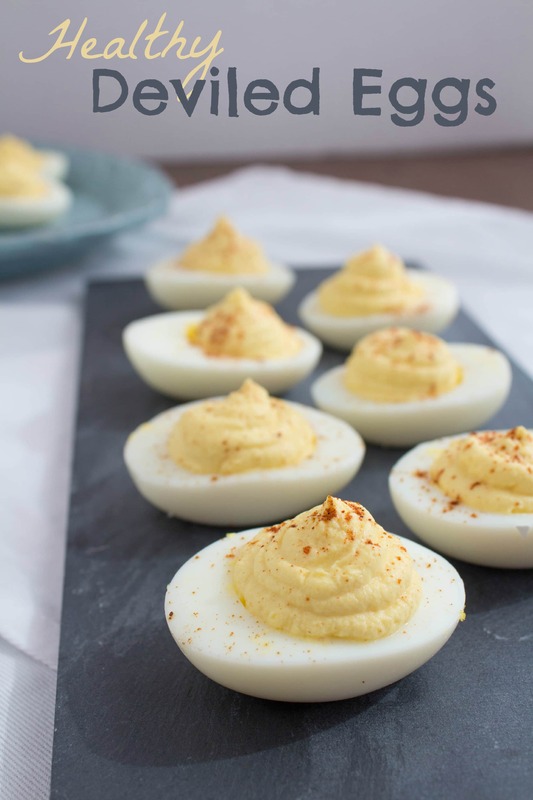 There are many variations possible with deviled eggs, as a few people suggested. When I didn’t have paprika, I used chile powder for a similar look, and also I knew the taste would work. Red pepper, salt, cumin, etc. It was fine. Another simple variation is putting some curry powder in the mixture. The chives idea above is another. It’s eggs. Whatever makes any sense will work. What the heck, bacon bits or whatever. It’s too bad that someone writing about what is supposed to be healthier food, (and substituting Greek yogurt for mayo obviously is healthier and lower calorie without further calculations) is just FAR TOO BUSY to spend a few minutes figuring out the actual nutrition numbers. Thanks to those who weren’t FAR TOO BUSY to spend the few minutes! One might think that with that Miles Per Hour in Nutrition that wouldn’t be all that hard. Oh (no edit feature) I meant to mention that the pesto suggestion above sounds like another good one. The reason I don’t share nutrition information for my recipes is not, as you assume, because I am lazy, but because I am anti calorie counting. I work with clients using an intuitive eating approach, so sharing calorie counts isn’t part of what I preach. She’s sharing a recipe for free. You shouldn’t criticize her for not doing more, for not doing what YOU THINK she should be doing with her time. Nutrition facts were posted back in January by someone who cared, and the info was shared for free. What more do you want? A free recipe, free nutrition facts. Seems to me it’s all good yet you found a way to complain. I was just surfing for a healthy alternative for our 4th of July BBQ and this sounds great…what I don’t understand is why emjayay has to be so mean – this is FOOD not a discussion on politics or religion. Maybe your blood sugar was a little low :) Have some wine and relax! This does cut out the fat from the mayo, but I have to watch cholesterol, so I was hoping the yolks weren’t used. If you’re watching your cholesterol, it would be better to keep an eye on refined carbohydrate/added sugar intake! In my opinion, you left out one of the essential ingredients in a deviled egg…vinegar (white, or apple cider will work), and it’s not even “unhealthy”! I didn’t know vinegar was usually in deviled eggs! What a great recipe! I’m a southern girl, and Deviled eggs were a staple on Memaw’s Sunday dinner table growing up. How I miss them! This recipe allows me to enjoy them again guilt free! I also added a few drops of Siracha for extra kick! Yum!!! Thank You! My kid become a fan of this recipe.She loves it lot and enjoy eating this,Thanks Anne for providing such a tasty and healthy dish for my kid. My son LOVES deviled eggs. I’m def going to have to try this recipe. Thanks! I hope he enjoys them! Greek yogurt makes my face puffy. Mayo does not. Mayo is quite healthy if there isn’t soy or canola oil in it. How do I PRINT the recipes? Sorry, this is an old recipe from the early days of my blog that I haven’t yet had time to move over to my recipe plugin (which has a printing function). So for now, you’ll have to just copy and paste it into a Word document to print it. Sorry about that! These sound good and less fatty than regular mayo. We used to make our own homemade mayo using egg yolks, mustard, canola or olive oil, and red wine vinegar. It tasted a lot better than the store-bought stuff. I usually try to buy light mayonnaise now. Am gonna make this tonight!..just waiting to taste it..